The Regional Organization for the Protection of the Marine Environment (ROPME) is concerned with disseminating information and knowledge for the protection of ROPME sea area. ROPME has a wealth of data and information that are considered an important asset for ROPME Activities. ROPME has identified the need to establish ROPME Integrated Information System (RIIS) that would allow proper management of the existing data and information. RIIS will allow disseminating the valuable information to the Region. RIIS has been designed to provide different types of outputs: spatial, graphical, and tabular. This would allow preparing information for decision and policy makers, scientific and research institutes, agencies responsible for managing ROPME sea area coastal zone, and the public. The ROPME Integrated Information System (RIIS) is a web-based application for archiving, organizing and sharing RSA data available at the ROPME Secretariat. RIIS has 4 modules and each module is designed to visualize data pertaining to a particular project/ activity. RIIS is primarily a spatial application from where data on the 4 modules and sub-modules are embedded and displayed on this platform. Apart from showcasing existing data on the RSA, future plans are being formulated to enhance and integrate new and existing datasets into the core of the RIIS modules. 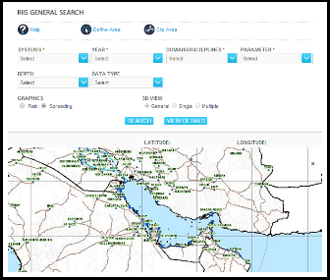 Country Profile Information System- CPIS contains country-wise data particularly marine indicators, national resources (experts, institutions, etc) and technical reports such as those on Harmful Algal Bloom (HABs), Fish Kill, Mammal Mortality, Marine Biodiversity, etc.